This is another photo that I managed to grab whilst in transit to Karratha from Exmouth. I have no idea why the sand was doing this at this particular place as it wasn’t happening on any of the other islands. It was really very spectacular from the air. It must’ve been one massive rip. The whole area is scattered with really cool little islands like this one. 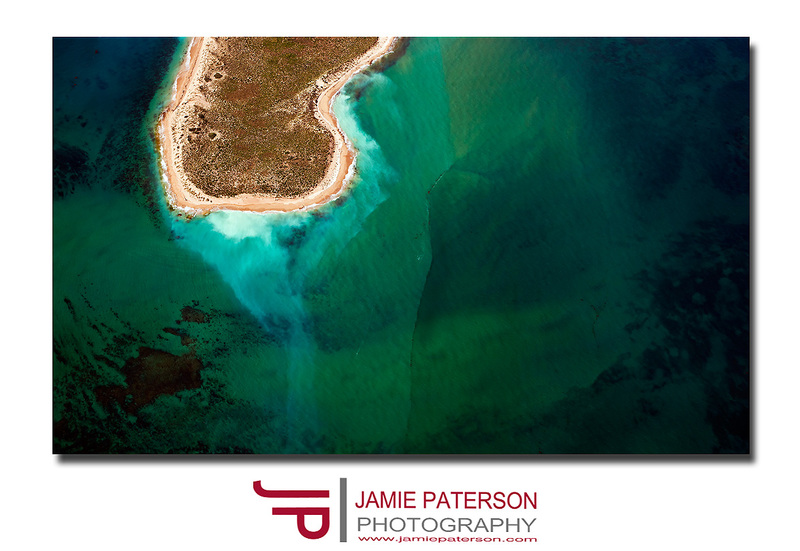 This entry was posted in australian landscape photography and tagged "aerial photography", australian landscape photography, exmouth, helicopter photography, landscape photography, murion islands. Yep, really like this one mate, one of the best heli-shots I’ve seen actually. Wow. Great compliment mate. Thanks for that. Yeah I really liked this one as well. Thank you very much for stopping by and commenting again. Really appreciate it as always. Beautiful work mate, love the detail in the island.. great colours too! Thanks Paul. That is what struck me about this scene. The beautiful deep greens in the ocean. I’m going to print this one out nice and big. I couldn’t agree more. Its simply seeing your work ‘in the flesh’ isn’t? Amazing shot Jamie, really awesome. Thanks Andrea. It was just an awesome day with no clouds which made for great photos. Very cool Jamie – you certainly are scoring yourself some sweet gigs lately ! Hi Tony. Thanks mate. Yeah it was heaps of fun.